Occasionally, the webmail interface for Rackspace email has issues. That’s been happening on and off for the last few days. If you access your email exclusively through the webmail interface, you will have noticed a problem trying to log in. 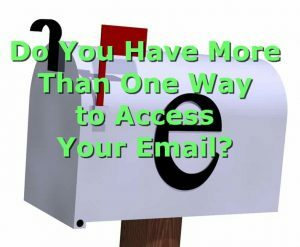 If you use an outside access interface, such as Outlook or Thunderbird, or via a cell phone app, you wouldn’t have noticed any issues. Although the webmail interface works perfectly 99% of the time, it’s that 1% that can make you feel so frustrated. This is why we recommend setting up more than one access point for your email. As mentioned above, you can use an email client on your computer, like Thunderbird or Outlook, or use your tablet or phone’s email app to access mail. If you are an Acorn hosted email client and would like to have assistance setting up your email in this way, and don’t feel this is an emergency, please submit a Support ticket HERE. If you need help today, please call Support at 719-329-0977, ext. 1 or send an email to: support@acorn-is.com. Please keep in mind that you are not “losing” any email. Email is still being delivered, it’s just not accessible via the webmail interface. This entry was posted in email by admin. Bookmark the permalink.